Unawqi had two beginnings, like trails in two separate forests that merged together in an open plain that was more or less the a-ha moment. The first inspiration came while sitting on the front porch of my good friend Thomas Merton Brightman at his retreat center near Hampstead, Maryland. It was a beautiful morning looking out over the rolling hills, but there was something odd standing right in front of me that I couldn’t look past: a dead tree in whose limbs were resting a bunch of freshly picked sunflowers. It was such a striking thing, I couldn’t help bring it up to Thomas. He responded in his usual soothing and philosophical manner. “Oh yes, old man with sunflowers in his arms.” That phrase was so beautifully packed with symbolic meaning, it unleashed a trove of instant and profound creativity deep within me that would stay with me and with my pen for a very long time, and out of that pen came the questions about why an old man would have sunflowers in his arms; what melancholy was his backstory (dead tree) and why did he cling to the contrast of something so bold and beautiful (sunflowers)? The second strand of inspiration answered my first set of questions in an existential way. In 2011 my fiancé from Colombia, Julio Garcia, rather suddenly took his own life. Like everyone else, I was at first stunned and looked for empirical answers as to what was ‘the news’ that brought this about. I was looking for the forensic answers that would leave no doubt so we could all bury him in our minds and move on with life. That was until the very character of that search bothered me, and I realized any answers found would not be adequate, nor do any justice to his life. I came to believe he took his own life because its beauty so clashed with the suffering he lived with from his birth and could not separate himself from. I believed his story is what made him beautiful, and it was richly complex, adventurous, magical, and needed to be told in a way that suited the largeness of who he was. Julio was a different prism of both the dead tree and the alive sunflowers, but he had the trajectory of life events that filled in the backstory. So the two inspirations merged over time, but as I base my writing in the recovery of ancient folklore and mythical realism, the way the story unfolded took a distinctive mythological form and drew upon equally magical places I have lived, in Tacoma, Washington, and in the Andes of South America. 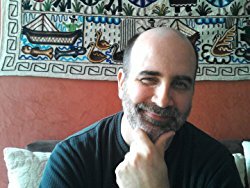 Kali Kucera is an American lorist and short story writer living in Quito, Ecuador, where he also rides and writes about bus and train travel. Since he was 9 years old he has been composing plays, operas, short stories, and multi-disciplinary experiences. He has been both a teacher and performer as well as an arts mobilizer, and founded the Tacoma Poet Laureate competition in 2008. 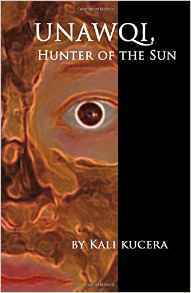 His latest book is the mythical realism novel, Unawqi, Hunter of the Sun.